Arthritis, a condition that affects as many as 1 in 3 adults, also affects cats. Feline arthritis is a degenerative joint disease. The cartilage within the joint is worn down, leading to inflammation, pain and decreased quality of life. As the condition progresses, the friction can wear down to the point where it damages the bones themselves. This kind of arthritis is most common and causes the most pain in the weight-bearing joints like the shoulders, hips, elbows, knees, and ankles. Osteoarthritis is often not diagnosed in cats because it is difficult to recognize even for the most dedicated cat guardian. The signs can be subtle, and since cats are such masters at masking pain, it often remains untreated. 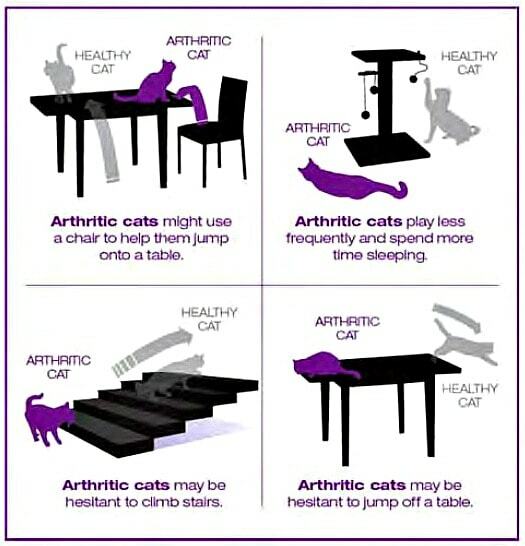 As many as 3 in 10 cats suffer from this debilitating condition, but only 7% of cats with arthritis receive treatment. Your cat may be more hesitant to jump, both up or down. Your cat may be reluctant to use stairs. Your cat may be less playful. Your cat may avoid the litter box (getting in and out of the litter box is painful). 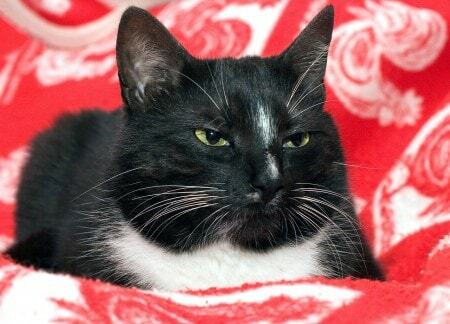 Your cat may be grumpier than usual. Your cat may change his eating habits. If you notice any of these signs, a visit to your veterinarian is imperative so your cat can receive a proper diagnosis. Many of these signs can also be indicators of other illnesses. Your cat’s veterinarian will perform a thorough exam, during which he may detect swelling or pain. He may take radiographs to confirm the diagnosis. A multi-modality approach is usually most effective in treating arthritis. Adjust your cat’s environment. Add steps or ramps to allow easier access to favorite sleeping areas. Use litter boxes with a low entry for easy access and high sides for cats that can no longer sqat. Use a fine consistency litter that’s easier on the paws. Glucosamine and chondroitin supplements such as Cosequin and omega-3-fatty acids can be useful in cats with mild to moderate disease. Manage obesity to reduce additional stress on your cat’s joints. Gently massage the large muscles around joints if your cat will tolerate it. Acupuncture can be an affective treatment if your cat tolerates the needles and repeated visits to the acupuncturists’s office. Reiki can help alleviate pain and stiffness. Homeopathy as prescribed by a veterinarian who is trained in the modality and can recommend remedies specifically for your cat. I do not recommend commercial homeopathic remedy blends as they often contain multiple remedies that have completely opposite actions. The Assisi Loop provides safe and effective pain control through targeted pulsed electromagnetic field therapy ((tPEMF™). Adequan (polysulfated glycosaminoglycan) is an injection that increases lubrication in joints and helps repair cartilage and inhibits cartilage destruction. Some cats seem to do very well on it, but little is known about potential side effects since its use for cats is currently off label. For severe cases, your veterinarian can prescribe anti-inflammatory or pain medications. Each cat requires an individual treatment plan, especially since arthritis usually affects senior cats who may have other concurrent health issues. Ingrid, Thanks for This information. My Buddy has arthritis quite bad in his hind legs mostly at the knee. I’ve been giving him 25 mg of gabapentin a day. I open a 100 mg capsule and divide it As equally as possible. My vet said the exact dosage was not critical. I put the 25 mg of powder into two pill pockets and Buddy eats it right down. I was giving him twice this dosage but he was stumbling even more (known side effect) so we cut the dosage in half. I’m also giving him Dasuquin. I’m currently looking for more aggressive treatment as I see him struggling more. Do you have an opinion on Antinol? I can get the green lipped muscle powder, but I worry about it being palatable. the Antinol Also contains Omega-3s and other fatty acids. My Winston has been on Adequan for several years. You have to start out with an injection every week, then can go down gradually to every 3 or 4 weeks. My vet says there are no side effects, except strengthening the bladder, which is a good thing. It was diagnosed when he suddenly could not jump up on the bed. I have started Adequan for my 18 pound Tommy. My dosing is different. I give two injections under the skin twice a week for 4 weeks. I give one injection once a week for the next 4 weeks. Then one injection one time a month for maintenance. He has arthritis in his front leg, causing limping. I could not get him to take the other alternatives added to his food. Hoping this will work for him. Was wondering if you are still giving it to your Winston? Sorry for such a late reply – I just saw it! Yes, he still gets Adequan, but now it is weekly, along with Antinol twice a day, and Buprenorphine gel. His pancreatitis has spiked and he limps on 3 out of 4 paws. I recognized arthritis in my senior cat when I saw that his gait had changed going up and down stairs. I gave him liquid supplements: glucosamine & chondroitin in a liquid called “Joint Purr-fection” and additional hyaluronic acid, also in a liquid (there’s not enough HA in a combination supplement to be helpful, about 10X as much is needed). I put the doses together into about a half jar of Gerber stage 2 baby food ham each AM, and he loved it. No struggle getting it into him. His arthritis improved a great deal. This is such an important subject. I’m convinced that I have recognized it late in my seniors. People really need to be on the lookout for it in all cats as they age, and I’ve found that a lot of vets feel like they have limited tools to help cats once it’s advanced enough to become obvious. Your roundup of suggested modalities is something I’ll be referencing again in the future. Thanks for sharing it! I’m so glad this was helpful, Julie. I recognized it too late in Amber and was mortified when it showed up on x-rays that were taken for an unrelated problem. It was only then that I realized what I had been seeing in her behavior. I recently heard that frankinsence works to treat arthritis in pets and humans. I have not tried it, since neither the cat I care for nor I have arthritis. I caution people against using essential oils with cats. It’s a controversial topic, and I’m just not convinced that it’s safe. The frankincense used for arthritis is oral, not an essential oil, a concentrated extract called 5-Loxin, because it inhibits the 5-LOX enzyme. Thank you for clarifying, Cheri. Hi Ingrid. Pepper, who just turned 10, was recently diagnosed with TMJ and later I was informed it was also degenerative arthritis. It is most cruel for him as it affects his mouth and of course eating has been difficult. When he eats I hear the bones grinding together. He has been on Natural Egg Membrane(which contains naturally occurring glucosamine, chondroitin, hyaluronic acid, collagen and calcium). Progress is slow however combined with CannaVet he is living pain free and his quality of life is good. He does make strange motions with his mouth in the middle of the night. Like he’s biting the air. I often wonder if he feels the cartilage growing? I’ve beaten myself up about his condition, that I should have recognized his problem earlier but like you mentioned it is sometimes difficult to flag. I only wish he could talk to me. Don’t beat yourself up over it, Robyn. You’re getting Pepper help now, and that’s what matters. Thanks for the informative post Ingrid.